Euan Ashley and his colleagues have identified what they believe would be a better drug for use on stents that prop open clogged heart arteries. Stanford University School of Medicine researchers hunting for a better drug coating for coronary stents, the small mesh tubes used to prop open plaque-filled arteries, have pinpointed a cancer drug as a possible candidate. In mice, crizotinib helped to prevent stent disease, the often-serious medical problem caused by stents themselves, without affecting the blood vessel lining. The medication has already been approved by the U.S. Food and Drug Administration for chemotherapy. A paper describing the findings was published online Nov. 17 in The Journal of Clinical Investigation. The study is also an example of scientists harnessing vast quantities of data to understand genetically complex diseases. By combining text analysis of the whole medical literature with data from large-scale genetic studies in humans, the researchers built a theory that they then tested in the laboratory. “We used human tissue to identify novel mediators of disease using the computational biology approach — the ‘big data’ approach,” said Ziad Ali, MD, PhD, lead author of the paper. Ali was a cardiovascular fellow at Stanford during the first years of the study and now is associate director of translational medicine at Columbia University Medical Center. 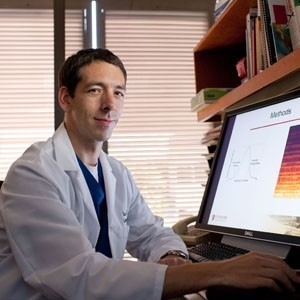 In order to find a more effective drug to use on stents, the researchers first wanted to better understand the genetic pathways of coronary artery disease, also known as coronary atherosclerosis. The disease is caused by the buildup of plaque along the inner walls of heart vessels. The buildup can eventually lead to chest pain and potentially lethal heart attacks. It is the leading cause of death worldwide. Balloon angioplasty is a common treatment for atherosclerosis. It’s used to open up a clogged artery, often in combination with the placement of a stent that helps keep the artery open. But stent disease, or in-stent stenosis, is the major limitation to this treatment. This occurs when the stents themselves damage the artery lining, causing the growth of scarlike tissue that narrows the vessels. Such narrowing can lead to recurrence of symptoms and even heart attacks. To solve this problem, drug-eluting stents are used to block such growth. These stents can help but also can inhibit the regrowth of the lining of the blood vessel, the endothelium, leading to delayed arterial healing and increasing the risk of blood clots and heart attacks. Thus, patients treated with drug-eluting stents, a total of 1 million each year nationwide, according to the American Heart Association, require longer treatment with blood thinners to prevent sudden stent blockage from a blood clot. This makes drug-eluting stents less desirable for people with bleeding problems or those who will need some type of surgery within a year after the stent is put in. “Even though we’ve made drug-eluting stents, still 10 percent of stents block up,” Ali said. “Patients have to take a blood thinner for about a year. A lot of our patient population is on the elderly side with bad hips or diabetes. Once you get a drug-coated stent, you can’t have surgery for a year. And if you stop the blood thinners for any reason, you’re at risk of a stent clotting off. And that actually causes a heart attack. Stent thrombosis has a high mortality rate. “Our idea was to find a novel therapeutic that would stop the regrowth while not affecting the endothelium of the vessels,” Ali said. To study the genetic pathways involved in coronary artery disease, researchers started with a gene network analysis of coronary artery samples collected from 89 patients in Germany. Their analysis identified the gene GPX1 as associated with cardiovascular events. GPX1 is one of the body’s strongest natural antioxidant defense mechanisms. They further tested this by studying mice with atherosclerosis in which the gene had been knocked out. Plaque increased significantly in the arteries of mice with knocked-out GPX1. Conducting further analyses of gene interactions in two studies — one from Japan, the other a meta-analysis of genome-wide data for stent disease done in the United States — researchers found that there was an increased risk of the disease from regulatory interplay between two genes, GPX1 and ROS1. The major finding of the study is that artery stent disease acts surprisingly like a tumor in the blood vessel wall. To test whether inactivation of ROS1 could help modulate the damage to blood vessels, researchers applied the chemotherapy drug crizotinib — which is used as a personalized medicine treatment for certain ROS1-positive lung cancers — to mice with coronary artery disease and surgically implanted stents. They found that the drug stopped stent disease and didn’t damage the endothelial growth. These results also highlight the need for targeted rather than broad-spectrum therapies, the study says. Other Stanford co-authors are Vinicio de Jesus Perez, MD, assistant professor of medicine; postdoctoral scholars, Ke Yuan, PhD, Stephen Pan, PhD, and Kathia Zaleta-Rivera, PhD; research assistants Mark Orcholski, Yoko Kojima and Xiumei Qu; Christopher Adams, PhD, director of proteomics at the Stanford University Mass Spectrometry Laboratory; Nicholas Leeper, MD, assistant professor of vascular surgery; and Thomas Quertermous, MD, professor of cardiovascular medicine. The study was funded by the National Institutes of Health (grants 4R00HL109256, R00HL089413, DP2OD004613 and R01 HL105993) among others. Information about Stanford’s Department of Medicine, which also supported the work, is available at http://medicine.stanford.edu.